Cosmovox is a unique and innovative musical instrument for the iPhone and iPod touch. Cosmovox allows you to make music simply by moving your iPhone! 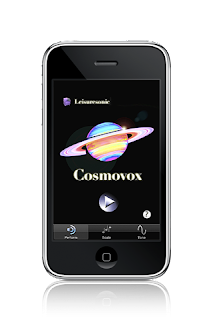 Cosmovox is compelling and fun regardless of your musical skills -- young children, curious professionals and trained musicians alike enjoy Cosmovox tremendously. It is a brand new instrument to explore with amazing expressive possibilities! Now for a mere £1.19 I'm willing to give it the benefit of the doubt. For me this is the kind of app that Apple's mobile platform is made for. Performance based instrument software that makes real use of the hardware's capabilities. Of course that's what is promised by the likes of Noise IO synth which has been delayed to later this month and of course PianoFly from miniMusic which still hasn't arrived as yet.